That the historical Jesus was a Jew, that his followers were Jews, and that the Gospels as well as the letters written by the apostle Paul are Jewish writings, firmly embedded in first century C.E. Judaism—all this has become almost commonplace. After long and bitter battles, this fact now has a foothold not only among historians of ancient Judaism but even among the most dedicated Christian theologians and the old influential school of New Testament scholars who tried to relegate the new message of the New Testament to a less Jewish, more Hellenistic background. Indeed, the pendulum has swung far in the opposite direction, with scholars outdoing each other in proving the Jewishness of Jesus and the New Testament, and arguing that there is nothing in Jesus’s message as reflected in the New Testament that oversteps the boundaries of what might be expected from the Judaism of his day. The most recent voice in this chorus is Daniel Boyarin’s. His new book has a somewhat misleading title, The Jewish Gospels, because nobody doubts that the Gospels are Jewish. But it is his subtitle, The Story of the Jewish Christ, which makes clear what actually is at stake: nothing less than the claim, announced with great fanfare, that the evolving Christology of the New Testament and the early Church—that is, the idea of Jesus being essentially divine and human, the divine-human Messiah and Son of his Father in heaven—is deeply engrained in the Jewish tradition that preceded the New Testament. Theologians would call this idea “binitarianism,” that is, the notion of two divine figures of equal substance and power, mostly an older and a younger God (or Father and Son). The ideas of Trinity and incarnation, or certainly the germs of those ideas, were already present among Jewish believers well before Jesus came on the scene to incarnate in himself, as it were, those theological notions and take up his messianic calling. One would expect Boyarin to jump at these and similar traditions and join in with the growing research literature on this significant topic. But he does nothing of the sort. He does not even bother to mention the relevant literature. Instead he pretends to have invented this wheel, and attributes the discovery of the pre-Christian binitarian Jewish theology to himself. Crucial for this claim is his first chapter, which reveals the major assumption on which his book is built—that, paradoxically, the appellation “Son of God” refers to the Messiah as a human king, whereas the appellation “Son of Man,” contrary to what most Christians believe, refers to the divine redeemer, that is, the divine origin of the Messiah. All the relevant pre-Christian Jewish sources as well as the New Testament sources have been exemplarily presented and analyzed by Martin Hengel in his seminal book, The Son of God: The Origin of Christology and the History of Jewish-Hellenistic Religion, published in many editions, of which Boyarin seems unaware. to be consumed and totally destroyed. This interpretation by the angel provides the historical background of the vision: the court’s judgment results in the dominion being taken away from the ruthless Seleucid king Antiochus IV Epiphanes and given as an everlasting kingdom to the people of Israel (the “holy ones of the Most High”). So what is at stake here in Daniel 7 is the concrete historical situation after 175 B.C.E., with the Seleucid oppression of the Jews and the Maccabean revolt against it, and the question of who is the Son of Man needs to be answered against this historical background. Boyarin dismisses the possibility that the Son of Man is a collective earthly figure, that is, the people of Israel—quite rightly, in my view—but he does not discuss seriously the much more likely alternative that the Son of Man is the archangel Michael, who represents Israel in heaven. (To be more precise, Boyarin does refer to this possibility in a note, but declares dryly that he nevertheless prefers his own reading.) According to this view, favored by many scholars, the vision of the Ancient of Days and the Son of Man anticipates what is going to happen soon on Earth: Michael, as Israel’s guardian angel, is given dominion and kingship in heaven as a prelude to the dominion and kingship given to the people of Israel on Earth—mentioned explicitly in the explanation of the vision—when the Maccabees ultimately will defeat the Seleucid king and destroy his wicked kingdom. THIS CONCLUSION leaves the informed reader puzzled—all the more so because, later in his book, Boyarin acknowledges that the explicit mention of the people of Israel in Daniel 7:27 as the counterpart of the Son of Man in Daniel 7:14 makes his reading of the people of Israel as a symbol for the Son of Man rather improbable. But he insists that this tension is inherent in the chapter in Daniel that originally referred to the Son of Man as a divine being, when it is not; and that the author/redactor of the Book of Daniel tried to suppress this original meaning. He even goes as far as to argue that this divine-human Son of Man of Daniel presages and is even identical with “the Christ, Jesus, who is accordingly handed over to the wicked one for a prescribed interval.” With the latter he appeals to Daniel 7:25—“And they will be delivered into his hand, until a time, two times, and half a time”—claiming that “they” does not refer to the people of Israel, as a literal reading of the text suggests, but to the Son of Man, and that even Jesus’s resurrection after three days possibly derives from a close reading of this passage in Daniel. The Church Fathers would have loved this exegesis, and I wouldn’t be surprised if it can be found somewhere in their voluminous works. But the evidence that Boyarin provides for his peculiar reading of Daniel 7—flatly against the grain of the Biblical text itself—is rather dubious. In order to prove the divine nature of the Son of Man, he first points to the fact that clouds in the Hebrew Bible are common attributes of divine appearances (theophanies), and that accordingly the Son of Man’s coming on the clouds of heaven elevates him to a divine being. It is true that the cloud is a divine attribute, most visibly in the Book of Exodus, but the phrase “coming with the clouds of heaven” in Daniel 7:13 (in Aramaic, not in Hebrew!) is unique, and nothing prevents us from assuming that the late Book of Daniel bestows on the archangel Michael an attribute that in the earlier parts of the Bible is reserved for God. This does not yet make him a divine being, let alone a second god. Boyarin also invokes the Canaanite gods El and Ba‘al, the former being the ancient sky god and the latter his younger associate, whom the Bible tried—not always successfully—to merge into one God in order to accomplish its idea of a strict monotheism. The notion of a duality within God, he argues, is present in the Hebrew Bible itself. Fair enough—nobody would want to disagree with him here: that duality was a condition that the Bible sought not to affirm but to overcome. Yet with such a broad perspective on origins, almost anything that later emerges in Christianity could be traced back to the Hebrew Bible. This is more or less the essence of what Boyarin’s book has to offer in support of its questionable thesis. The long chapter about the Son of Man in the Similitudes of the First Book of Enoch and the Fourth Book of Ezra does not add much that is new, but merely builds on Boyarin’s dubious reading of Daniel 7. Anyway, it has long been recognized that the Son of Man of the Similitudes is obviously a major source for the conception of the New Testament’s Son of Man. And then there is the chapter called “Jesus Kept Kosher,” which offers a new interpretation of the controversy between Jesus and the Pharisees about eating with defiled hands. Boyarin argues that Mark is not referring to kashrut, but to laws of purity that the Pharisees tried to impose on their fellow Jews; and that Jesus railed not against keeping kosher as such but against these Pharisaic innovations. No serious New Testament scholar would doubt the former part of this argument (Jesus did not want to do away with the laws of kashrut); and the latter part (Jesus quarreled with the Pharisaic concept of ritual purity) is heavily indebted to the work of the young Israeli scholar Yair Furstenberg. BOYARIN’S BOOK concludes with a chapter about “The Suffering Christ as a Midrash on Daniel.” It basically contends that Jesus’s vicarious suffering and death is informed not only by the Suffering Servant of Isaiah 53, which can be taken for granted, but also by Boyarin’s strange reading of Daniel’s vision. It also claims that the idea of a suffering and dying Messiah was common among the rabbis, relying mainly on a single passage in the Jerusalem Talmud that refers to the mourning over the Messiah’s death (Boyarin’s reading of it is by no means as certain as he pretends it is), and on the famous passage in the Babylonian Talmud about the leper of the house of David (quoting Isaiah 53), and on another passage that is preserved only in Raimundo Martini’s medieval Pugio Fidei and may or may not go back to a fourth-century midrash. This is not much. Worse, Boyarin completely ignores the most important evidence of the vicarious suffering of the Messiah Ephraim in rabbinic Judaism, in the midrash Pesiqta Rabbati, where the notion of the Messiah’s vicarious expiatory suffering returns to the Jewish tradition. These texts have been thoroughly discussed in recent scholarship, and it has been argued that they most likely belong to the first half of the seventh century C.E. and may well be a rather late response to the Christian usurpation of the Messiah Jesus’s vicarious suffering. If this interpretation is correct, then there is clearly not a single unbroken line of tradition leading from Isaiah 53 through of all places Daniel 7—to the New Testament and the subsequent rabbinic literature. Instead what we encounter here is the rabbinic re-appropriation of a theme that is firmly embedded in the Hebrew Bible, was usurped by the New Testament Jesus and therefore largely ignored or better suppressed by most rabbis, only to make its way back later into certain strands of rabbinic Judaism. With his insistence on the fact that some of the key Christian concepts are found in pre-Christian Second Temple Judaism, Boyarin has taken up an enormously important and controversial subject, even if with his narrow and misguided focus on the Book of Daniel and the subsequent Son of Man tradition he has missed the chance to open this discussion responsibly to a larger audience. But why, aside from the academic matter of truth in scholarship and rigor in interpretation, does all this matter so much? The answer is that these learned debates have important ramifications. First and foremost among them is the recognition that Second Temple Judaism offers a much more complex and multifaceted fabric of ideas and thoughts than many Christians and Jews today are prepared to acknowledge. The various Jewish sources and schools (some of them mislabeled as “sects”)—represented by the late books of the Hebrew Bible, the Apocrypha and Pseudepigrapha, the literature of the Dead Sea Scrolls, Philo, and indeed the New Testament—are overlapping, often competing, but always legitimate parts of this teeming spiritual culture. 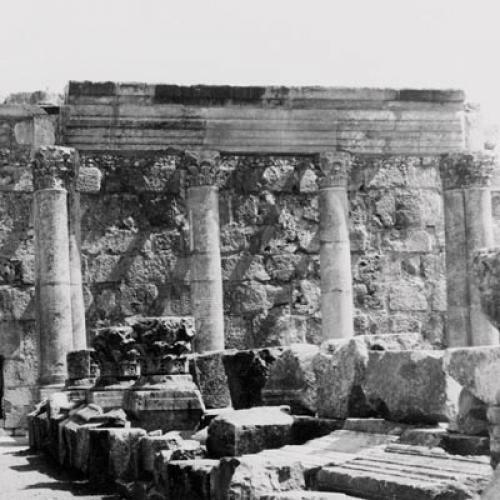 After the destruction of the Second Temple in 70 C.E., moreover, a process was set in motion that was geared toward taking stock and distilling some kind of “normative Judaism,” aimed at defining what is “in” and what is “out,” and thus eliminating trends and directions that were regarded as unwelcome or dangerous. It was then, in other words, that the activity of drawing lines and boundaries between “orthodoxy” and “heresy” gained momentum. There can be no doubt that the Christianity that was emerging as one Jewish faction among others was part and parcel of this process, struggling to define itself within a highly complex power game of competing groups of thought. Thanks to the so-called gnostic writings discovered at Nag Hammadi, we have a much clearer picture now of what this power game entailed, and what kind of “heresies” were eliminated. The same is true for what would become rabbinic Judaism as the ultimately triumphant form of post-Second Temple Judaism—and here too, thanks not to new discoveries but to more careful and open-minded research, we have a much clearer picture now of how rabbinic Judaism was shaped. It turns out, for example, that the old binitarian idea of two divine figures, presaged in Second Temple Judaism and adopted by the New Testament, lived on in certain circles in rabbinic Judaism, despite its ever more sophisticated formulation in Christian theology with its climax in the doctrine of Trinity. The most prominent example of rabbinic Judaism’s ongoing preoccupation with—and its struggle against—binitarian ideas within its own fold is the elevation of the prediluvian patriarch Enoch to the highest angel Metatron, enthroned in heaven next to God and granted the title “Lesser God.” This is a concept that seems to come directly out of the New Testament playbook. Scholars have long tried to dismiss such ideas as the products of some crazy heretics, or at least to relegate them to the fringes of normative Judaism—but it has become ever more apparent in current research that they were taken seriously by certain rabbis, and all the more fervently attacked by those who would come to form mainstream Judaism. Yet the incontrovertible fact remains that they were discussed within rabbinic Judaism. For modern believers of both religions, these scholarly explorations will be frustrating. Some clear-cut and neat distinctions between Judaism and Christianity are being destroyed by contemporary research into the New Testament and rabbinic Judaism. Yet we—not only scholars but also educated Jews and Christians—have much to gain from this loss of simplicity: a new understanding of the intellectual and spiritual potential inherent in Judaism and Christianity before they became well-defined and even opposing religions, a better appreciation of crucial ideas cherished by both before they used precisely these ideas to demarcate themselves from one another. And we must not forget a later complication, or irony: some of these “heretical” ideas, suppressed by Talmudic Judaism, would return to Judaism ever more vigorously in what is commonly called Kabbalah. Peter Schäfer is Perelman Professor of Jewish Studies at Princeton University and the author, most recently, of The Jewish Jesus: How Judaism and Christianity Shaped Each Other (Princeton University Press).